The pig yard really needed help. Jon knew he needed to separate the male from the females and the female mamas from the other females and from the young weaned piglets . They had all lived together in an area where there is a natural spring so water and mud and vegetation are available year round. Things were a little scarce in the summer, but still adequate. 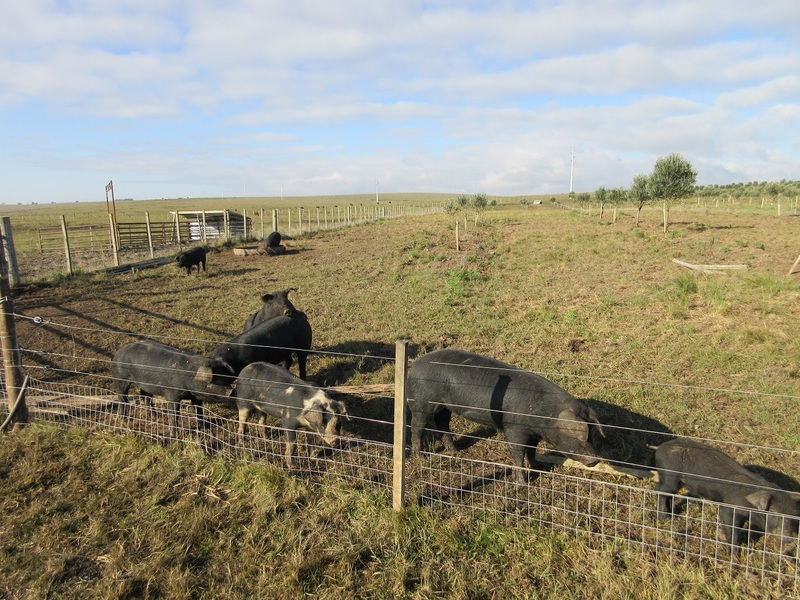 But as our pig population has grown and continues to grow we needed some major changes. Then in the middle of the olive harvest, a mama pig had a litter. The mama squished a few in the night as she slept, and the eagles had a few for dinner, and then mama abandoned the last two. One little one died, but the other I was able to rescue. The small chicken house became the piglets home. I took it milk and food and gave it scrap wool to nest in. It liked to be held and have it’s head scratched. It grew. It took to scrounging in the dirt and trying to eat anything it could. It came when it heard voices or the sound of the dog collars jingling and would talk at everyone. Even our guys liked to scratch the piglet and talk to it. We had a pet piglet! I can now totally understand why someone would think a pigmy pig would be a delight. But, when our little guy got big enough and was tearing up the chicken yard and went under the fence to the rooster area and ate everything in sight, it was time for him to go home. The guys took him back to the pig yard. He is doing fine. Jon had a plan and the guys were beginning to construct fencing when the pig yard turned into a lake with the heavy rains of our early winter. Luckily, there were high places for them to get out of the flow of the water, so no harm done. The first issue was to get the feed out of the mud. They built a raised platform to set everything on. It will eventually have a roof and sides; it is a work in progress. 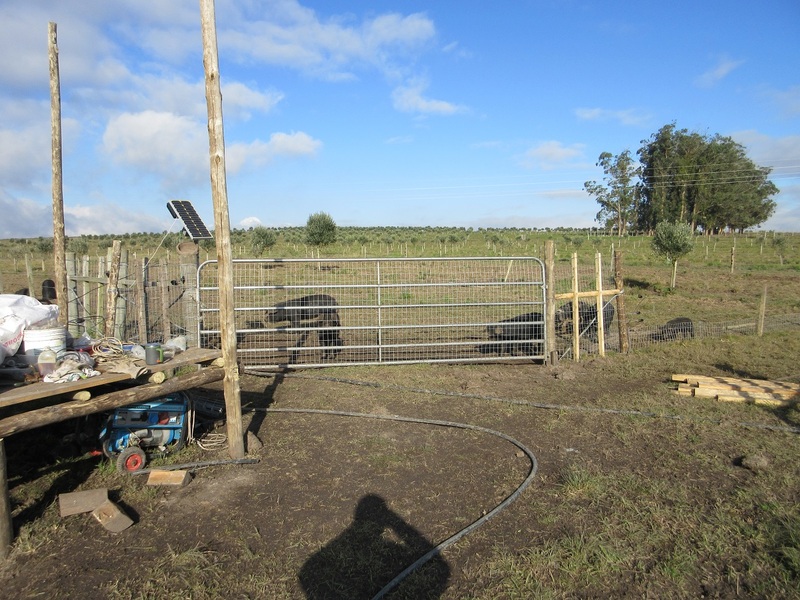 The guys built new fencing to separate the old pig yard into four new separate yards. Also a new yard was built at the bottom of part of the olive plantation that is really too wet for the olives but ideal for the pigs. This new area is used for the weaned piglets. Here is the view of the new pig area. We can walk and get the truck between each of the pen locations. The pig yard is located next to a creek and a lake between our two varieties of olive tress, so they are in the back part of the farm on the other side of a hill from the houses. Which is why I probably think they are so cute.